A lot of educators would argue that introducing ICT into the classroom is part of a general dumbing down of learning in the world today. How is this so? Well, putting iPads and tablets in the hands of pupils makes learning more pupil centred and it also makes learning more fun. Many educators would argue that teaching should be about giving pupils what they need and not what they want and that putting learning in the hands of the pupils, literally, is not the way to go forward. However, right or wrong, a more learner centred approach to education is the future. The argument of the pedagogues is that learning should be about disciplining the mind, at all levels of education. Essential to their argument is the dwindling role of the Classics in education. Up until the 20th century, any decent education would involve learning either Greek or Latin. Anyone who has studied either of these languages will know the discipline involved. Especially of the memory. For the pedagogues, the decline of the Classics in education is a sign of dumbing down. The old one way system of learning is being replaced by a model in which pupils interact and engage with the subject they are learning. Is the introduction of fun and games, through ICT, really dumbing down learning? What it all comes down to is imagination in education. In the past, we were taught to repress our imagination as it was considered childish. The mind was disciplined and intellect, especially memory, was valued above all else. 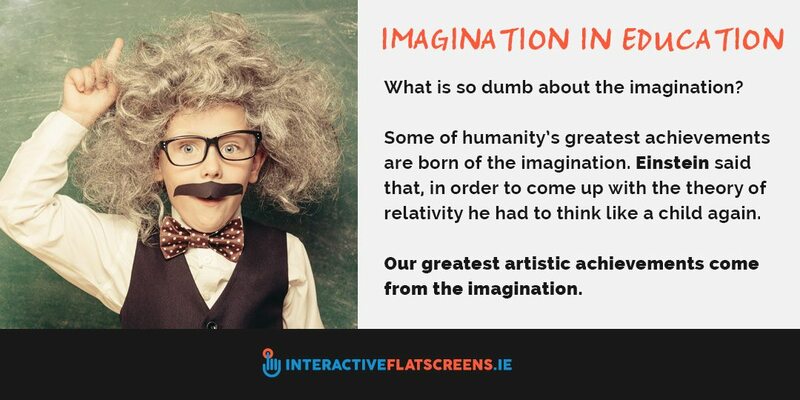 What is so dumb about the imagination? Some of humanity’s greatest achievements are born of the imagination. Einstein said that, in order to come up with the theory of relativity he had to think like a child again. Our greatest artistic achievements come from the imagination. Solving the world’s problems will require imagination. However, there is a lot to be said for a disciplined mind. No doubt it will help you get through life. It is a good preparation for adulthood and its responsibilities. Perhaps the way forward is a synthesis of the pedagogical model and the learner centred model. A valuing of both mental discipline and fun and games that stimulate the imagination. Certainly, both approaches are facilitated through ICT. As far as the pedagogical model goes, what is the interactive flat screen but a blackboard? A very powerful blackboard but still a blackboard. It takes learners out of their own machines and gives them a focus, an object. And, of course, the learner centred approach is supported by the use of tablets and iPads. 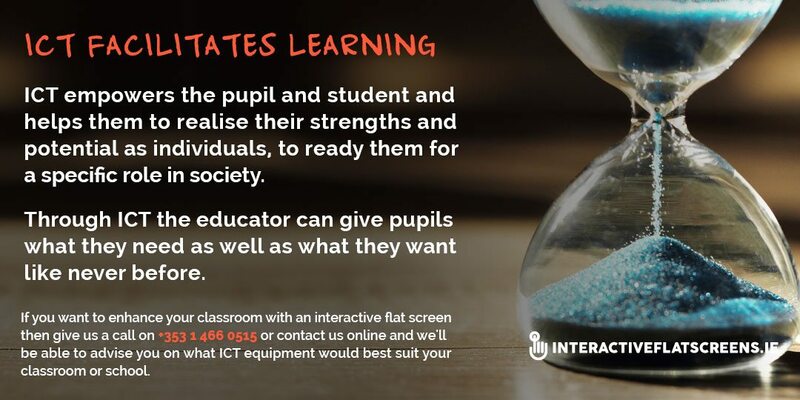 These devices empower the pupil and student and help them to realise their strengths and potential as individuals, to ready them for a specific role in society. Through ICT the educator can give pupils what they need as well as what they want. 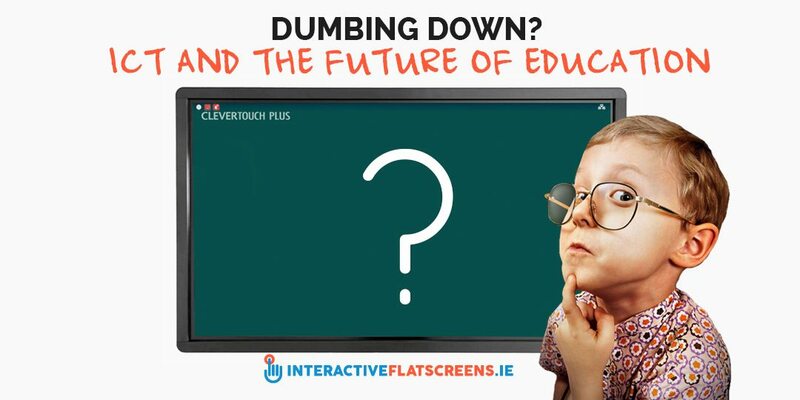 If you want to enhance your classroom with an interactive flat screen then give us a call on +353 1 466 0515 or contact us online and we’ll be able to advise you on what ICT equipment would best suit your classroom or school.